Fancy a career in the creative industries? If you’ve ever considered working in TV, film, media or the arts, you’ll know that it’s a tough road. To give you a helping hand, SUSU have arranged a number of professional workshops, panels and events that will give you the information you need to turn what you love into a career. Events will be happening from the 10 March to the 21. Come and meet people who make a living in the creative industries and find out how you can do the same. 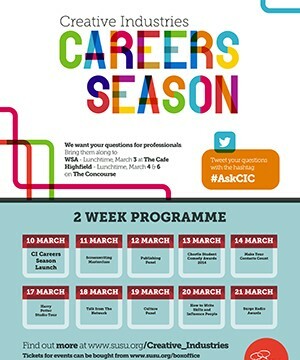 Student looking to work in any area of the creative industries would get loads of useful information from the CI Careers Season Launch event on the 10 March, and the sessions on the 14 and 20 March. Aspiring writers should check out the Screenwriting Masterclass on the 11 March, and the Publishing Panel on the 12 March. Publishing Panel will also be hugely useful for aspiring writers, journalists, publishers and agents. Those wishing to work in film and TV should go to the Harry Potter Studio Tour and production workshop on the 17March, and talk from The Network on the 18 March. The Network event will see an official spokesperson come down and answer your questions on how to apply and what you can expect. Plus, if you apply for The Network, you could be joining them at the world famous Edinburgh International TV Festival in August for FREE. This is a practical training scheme that gives you a taster of what it’s really like to work in TV. Students interested in pursuing a career in newspapers, magazines, online and broadcast can enrol on a practical journalism workshop run by News Associates on the 13 March. They will get you writing an article in a mock, `real-life¿ breaking news exercise, where you will learn essential reporting skills. Feedback will be given on your work and time is set aside for career advice. News Associates is the largest journalism training provider in the country and top-ranked for delivery of the NCTJ (National Council for the Training of Journalists) Multimedia Diploma. They are affiliated with leading press agency Sportsbeat. Aspiring visual and performing artists should check out Culture Panel on the 19 March. For more information or to book a place on these events, the links on the programme will take you where you need to go.